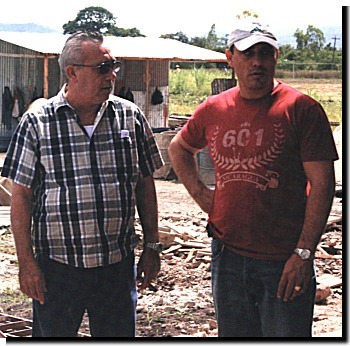 Contributing editor Gary J. Arzt recently visited with Pepin Garcia at his Nicaragua factory to learn how he is expanding his manufacturing capacity, enlarging his box factory, and implementing his own tobacco growing operation. Pepin Garcia�s swift rise to iconic cigarmaker status is the stuff of legend. Garcia left Cuba in early 2001, taking with him little more than his love of tobacco and his passion for cigarmaking. His exit followed by almost four years the departure of his daughter, Janny, and her husband, Amilcar, who arrived in Miami in 1997. Pepin�s wife, Maria, and his son Jamie followed at the end of 2001. 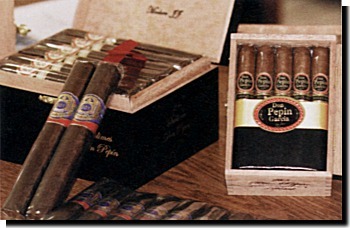 Pepin headed for Nicaragua, working in the cigar industry for two years before coming to Miami in 2002, where he joined Tropical Tobacco (now Tabacalera Tropical). Then in early 2003, he set out on his own and founded El Rey de los Habanos with his family in Miami�s Little Havana, quickly drawing the attention of the industry and earning acclaim among cigar connoisseurs. Recognizing the need for greater production capacity, Pepin returned to Nicaragua in 2006 and established Tabacalera Cubana in Estel�. The rest, as they say, is history. With accolades, high ratings, and sales growth all bolstering his success as he continues to operate both factories. In addition to his own Don Pepin, El Rey de los Habanos, Vegas Cubanas, and El Centurion brands, Garcia has built an impressive portfolio of high-profile brands that he produces for other cigar companies, including EO�s 601; Tatuaje and Caba�guan; Padilla Miami 8 & 11, Padilla Signature 1932, and Padilla 1948; Ashton�s San Cristobal; and Troya Classico among many others. SMOKESHOP: What is the capacity of your Estel� factory today? How many rollers do you have? 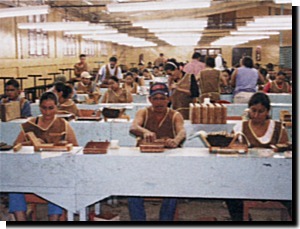 GARCIA: At this moment I have around 62 pairs of cigar rollers producing 18,000 to 20,000 cigars daily. SMOKESHOP: If a team of rollers can roll approximately 300 cigars a day, then you would need 15 boxes to pack each roller�s production. To my mind, that indicates a large box-making facility is necessary. GARCIA: Yes, boxes are an important part of producing cigars, and we make our own boxes to insure quality and availability. At our new plant, the box making is greatly expanded and was the first part of the facility to function - we began making boxes there in December. That will eliminate the one bottleneck in our operation. SMOKESHOP: What will the capacity be of your new factory? How many rollers will you employ there? GARCIA: In the new factory there will be around 100 to 110 pairs of cigar rollers. It will be an industrial complex that can house from 700 to 800 workers total because it�s an expanded factory with all modern machines. There�s two tobacco treatment facilities, housing all of the �pre-industrial� processes and applying all of the specialized processes to the tobacco. SMOKESHOP: By �pre-industrial� you mean the sorting, curing, and fermentation of tobacco? GARCIA: Yes. After that comes the factory which has its own cafeteria and medical office. We will also have, attached to the factory, five guest rooms and a dinning room for the visitors. And on the second level there will be a home for me and my family. SMOKESHOP: It is obvious to anyone who has smoked your cigars that you secure the finest tobaccos and, however you do it, your method of curing and fermenting only serves to make them better. Why do you feel the need to grow your own tobacco? GARCIA: Look, planting our own tobacco gives us plenty of confidence and assurances we�ll have all the prime materials and tobacco varieties we would ever want to use. Every brand of ours has distinct types of tobacco. Some have a similar variety, but others aren�t the same - there are distinct variations. That is why we can produce so many cigars and yet no cigar is the same. When someone plants their own tobacco, they�ve ensured the future of the company for two, three, four, even five years because you have a secure source of tobacco. At this moment, it is possible this year we will surpass 40 plots of land. At an average of 30 quintales [about 3,000 kg. ], we are talking about 1,200 quintales of tobacco, and that is just planted by us. This same amount will be grown by others for us, in order to have the varieties. By working our own land and by working with other growers, we assure ourselves that we will always have the variety of tobaccos we need. SMOKESHOP: Will you use the tobacco only for your own production or will you begin to sell tobacco to other makers? GARCIA: No, we will only use these tobaccos for our cigars - Don Pepin, etc. - and the cigars of our clients and partners - 601, San Cristobal, etc. SMOKESHOP: You are surrounded in your operations by a devoted family and employees, many of whom are like family, who oversee the tobacco operation. What are the various members of your family are responsible for? GARCIA: Look, every one of the family members is a principal voice. There are no minor voices here. Here we are all equal with our responsibilities. Jaime deals directly with the rent, with the clients. He is in charge of working with the clients who pay by the case; he supervises all the finished cigars. He is in charge of conversing with a large part of our clients. My son-in-law Amilcar supervises all the production leading to the finished cigar - checking the tobacco that will be processed and the other tobaccos that will not be processed. At the same time he and Jaime handle that part of the operation, both work at the forefront like my daughter, Janny, who works with all accounts and is the English-language connection for our company. Then it�s a centralized operation. I supervise everything that they do. I am at the estate, overseeing everything from the seedbed until the tobacco goes into production. I am at the forefront of all the operations together. All of us, along with the other family and the other professional personnel who have management, all of them, every one of them has a detail to look after. We have a good person at the head of every department, but every one of those people is supervised by the family in each one of those aspects. Janny, for example, is the economist of the company. SMOKESHOP: Janny is, in effect, the CFO of all your enterprises. GARCIA: Yes, Janny is the one who makes the cost transactions and the payroll transactions of the company. Janny is the primary economic manager of the company. She is the money person of the company. We are the workers in that case. She manages all the cost operations, money operations, credit installment operations for any type of situation; she�s the one who carries out these transactions. She always has the support of one of us. She�s almost always in Miami, and the rest of us stick around here. Janny has much more responsibility in Miami because the three of us need to be here to dedicate ourselves full-time because the growth of the company demands it. SMOKESHOP: You manufacture some of the most highly regarded and highly rated cigars in the industry. Will you continue to take on additional clients? GARCIA: No! Only the clients I have up until now. I want these brands to develop the 601, the blue label, the green label. San Cristobal may expand. And, we will develop the Don Pep�n Garcia brands: the blue label, the black label, the JJ and, as well the Vegas Cubanas and other brands we make in Miami as well. SMOKESHOP: After all, in one year I have seen EO�s 601 expand from two lines, the Habano and Connecticut, to four including the Oscuro and the Maduro. How much more manpower can you devote to that line alone, and still do justice to the other lines? GARCIA: We will support our clients/partners and apply enough manpower to meet their needs. The new factory has capacity to expand the work force and we will do that as much as we need as long as we can find the right workers that can be properly trained. But there will be no new clients. We will not increase in production if we don�t first respect the quality and then we can think about the production, the volume. Quality will always be present in the Garcia family, and then the volume of production. We will work to increase our capacity of the lines we now make. Every day will be some of better quality, never of lower quality. SMOKESHOP: If you were not making cigars, what would you like to be doing? GARCIA: The day I stop making cigars will be the day I die. I was born in a cigar factory, and inside a cigar factory I will finish the days of my life. Pepito will dedicate all his life to cigars, and when the world doesn�t want our cigars, I will sow a small piece of tobacco and will continue making cigars if God orders it. That is what I would be doing. Always cigars. Only cigars. El Rey de los Habanos, Inc., 1120 - 1124 SW 8th Street, Miami, Fla., 33130, Tel: (305) 858-0001, Email: info@elreydeloshabanos.com, Web: www.elreydeloshabanos.com.